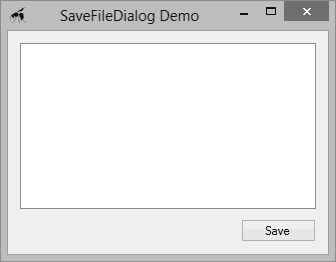 The SaveFileDialog class provides the functionality for one of the .NET framework's common dialog boxes. This dialog box provides the ability to users to specify the name and path of a file to be created or updated. 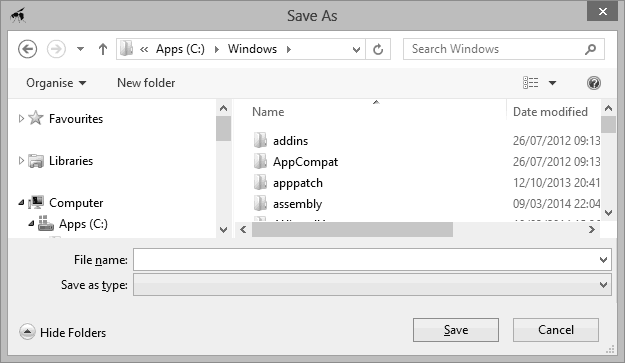 In this article we'll look at the save file dialog box. The save file dialog box is defined in the SaveFileDialog class. The dialog box allows the user to browse the file system to find the folder where they wish to save their data. It also provides a text box where they enter the name of the file to be created or updated, or they can select a file to be overwritten. You can configure the dialog box to filter the files according to one or more file extensions, making it very useful for software that allows for the creation of documents that can be opened and saved. Multiline = True Allows the input of some text to be saved. SaveButton Button Text = "Save" Displays the save file dialog box. As with the other common dialog boxes, to display the save dialog you create a new instance of the class and call its ShowDialog method. The resultant dialog box is modal, meaning that the window that opened it becomes unresponsive to input until the pop-up is closed. The ShowDialog method returns a value from the DialogResult enumeration that tells you which button the user clicked. You should only perform the save action if this value is DialogResult.OK. To demonstrate, switch to the code behind the window and add the following using directive. This will simplify access to the File class, which we will use to generate text files. Next, register the Click event by switching back to the designer and double-clicking the button. Change the code for the button click to that shown below. This writes the contents of the text box to a file when you provide a path and filename and click the dialog box's correct button. Note that the selected path is found in the dialog box object's FileName property. Select a folder to store a new file and enter a name into the File name box. For simplicity, use the .txt extension for the file so that Windows can identify it as a text file. Click the Save or OK button to complete the operation. The file will be created.